FHWA's research approach emphasizes cooperation, information sharing, and formal development of research agendas, both within USDOT and across the entire government. We promote partnerships with State and local governments, academia, and the private sector to quickly and cost-effectively transform new technologies and concepts into better transportation systems, processes, and services. Partnerships with other USDOT agencies: ITS Joint Program Office (JPO), NHTSA, Federal Transit Administration (FTA), Research and Special Programs Administration (RSPA), Federal Motor Carrier Safety Administration, Federal Aviation Administration, Federal Railroad Administration, Maritime Administration, USCG, and Bureau of Transportation Statistics. Partnerships with other Federal agencies (outside USDOT): National Aeronautics and Space Administration, Department of Defense, Department of Commerce, Department of Energy, Department of State, U.S. Environmental Protection Agency, Department of Health and Human Services, Department of Housing and Urban Development, Department of the Interior, U.S. Army Corps of Engineers, U.S. Army Cold Region Research and Engineering Lab, U.S Navy, National Weather Service, Forecast Systems Lab, U.S. Coast Guard, and Department of Agriculture. Partnerships with States or organizations representing States: AASHTO, LTPP, National Governors' Association. Partnerships with quasi-governmental organizations: TRB, NCHRP, and National Science Foundation (NSF). Partnerships with local governments, MPOs and other organizations representing local and county governments: National Association of County Engineers, Cities of Los Angeles, CA, Houston, TX (to evaluate CLAIRE), and Florida DOT. Partnerships with universities: UTCs, Minority Institutes of Higher Education (MIHE), STIPDG, Dwight David Eisenhower Transportation Fellowship Program (DDETFP), National Summer Transportation Institutes for Secondary Students (NSTI), Recycled Materials Resource Center, and George Washington University. Partnerships with industry: Castle Rock Services, Lockheed Martin, Iteris, Mitretek, GEOPAK® Corporation, Innovative Pavement Research Foundation (IPRF), SBIR program participants, Ford, General Motors, Toyota, DaimlerChrylser, and NAVTEQ™ Corporation. Partnerships with nongovernmental organizations: American Society of Civil Engineers' Civil Engineering Research Foundation, ITE, ITS America. When significant or widespread interest is shown in solving transportation-related problems, research, planning, and technology innovation activities and studies may be funded jointly by several Federal, State, regional, and local transportation agencies, academic institutions, foundations, or private industry under the transportation pooled fund program. FHWA plays a key role in this process. While FHWA participates and contributes directly to some pooled fund studies, it also encourages States to pool their funds for regional or national problems to avoid research duplication and to effectively use monies for managing research. To qualify as a pooled fund study, more than one State transportation agency, Federal agency, other agency (such as a municipality or MPO, college, university, or private company) must find the subject important enough to commit funds or other resources to conduct the research, planning, and technology innovation activities. A pooled fund study is intended to address a new area or complement or advance previous subject matter investigations. All studies receive funding from the States involved. Federal and State transportation agencies may initiate pooled fund studies and act as the "lead agency" for the study. Local and regional transportation agencies, private industry, foundations, and colleges and universities may partner with any or all of the sponsoring agencies to conduct pooled fund projects. In FY 2004, the TPF program included 100 FHWA-led projects and 140 State-led projects valued at over $155 million. The TPF Web site (http://www.pooledfund.org) permits online solicitations and funding commitments for new pooled fund studies and allows lead agencies to post work plans, progress reports, final report/deliverables, implementation activities, and other relevant information. The SBIR program is an R&D program mandated by Congress in 1982 and reauthorized in 1992. Its purpose is to develop technological innovations by using high level expertise in the small business community throughout the United States. The program aims to stimulate technological innovations; meet the Federal Government's needs for R&D by providing opportunities to small businesses; increase private sector commercialization of innovations derived from Federal R&D; and provide opportunities for minority and disadvantaged participation in technological innovations. One example of an SBIR research partnership is the Visual Freight Database, which is a public/private partnership that provides improved modeling tools for national, State, and MPO freight planning and information that shows county-to-county freight movements by modes and commodity types. The database is available for use throughout FHWA. U.S. highway transportation systems. This program enables advanced technology to be adapted and implemented much more efficiently without spending scarce research funds to recreate advances that already have been developed by other countries. Twelve scans are conducted over a 2-year period. Additionally, FHWA has a number of bilateral agreements with other countries. In October 2003, Dennis Judycki, FHWA Associate Administrator for Research, Development & Technology, represented the U.S. at the OECD/ECMT JTRC meeting in Paris. The JTRC reaffirmed its existing Working Groups and Roundtables for 2004 and 2005, as an extension of the preliminary Program of Work for 2005–2006 approved by the Ministers at their last meeting. In addition, a meeting was held with the OECD Ambassador's office in preparation for the ECMT Committee of Deputies meeting scheduled for October 14–15, 2004. OECD Road Transport Research (RTR) projects completed in FY 2004 included several projects for which the U.S. had the lead, including a report on new technologies for road safety, a symposium on human factors of technology for elderly users, and a symposium on road pricing cosponsored by the OECD, FHWA, TRB and Florida DOT in November 2003. RD&T researchers are also actively involved in an OECD RTR research project on the Economic Evaluation of Long-Life Pavements. The OECD RTR program undertakes policy-ori-ented research and evaluation of best practices, through joint ventures and international cooperation, and international data exchange. An FHWA representative serves as an official member of the OECD RTR Steering Committee that meets in April and October of each year. The Centre shall promote economic development and contribute to structural improvements of OECD and ECMT economies, through cooperative transport research programmes addressing all modes of inland transport and their intermodal linkages in a wider economic, social, environmental, and institutional context. Economic evaluation of long-life pavement. Young driver risks and effective counter measures. Congestion in large metropolitan areas. In particular, TFHRC researchers are playing an active role in the Economic Evaluation of Long-Lived Pavements. Phase 1 of this pavement project focused on long-life wearing courses and their economic viability. Two nonconventional materials are being investigated in participating laboratories located around the world. These materials are epoxy-asphalt and the use of a continuously paved high performance cementitious material. Throughout the effort, RD&T researchers shared the latest technologies, reports, and ideas on wearing course performance with stakeholders and international partners. Phase 2 of the study will focus on comprehensive joint testing of candidate course materials. Participation has been confirmed with 21 different countries. In September 2004, FHWA and Turkey's General Directorate of Highways (KGM) hosted a second workshop on state-of-the-art techniques for mitigating the damaging effects of earthquakes. The workshop, funded by the National Science Foundation, was a continuation of an established relationship between FHWA and Turkey started by the first workshop, "Lessons Learned from the Recent Earthquakes," jointly held in Turkey shortly after two devastating earthquakes took place there in 1999. 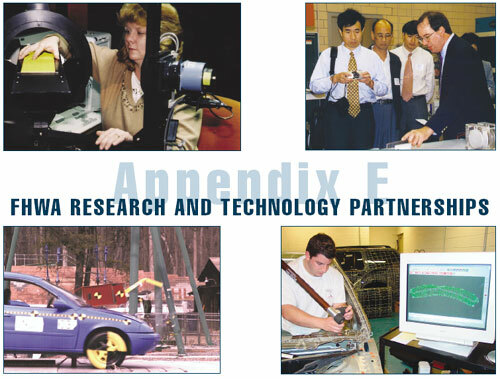 In FY 2004, the Joint Research Program focused on intersection collision avoidance systems. Intersection collisions represent almost 30 percent of U.S. crashes, or 1.7 million per year. Reducing these crashes is one of FHWA's highest priorities. A business meeting and information exchange among the participants in the ITS Joint Research Program was held in conjunction with the ITS World Congress in November 2003. Representatives from FHWA, the ITS Joint Program Office, and the Japanese Ministry of Land, Infrastructure and Transport discussed the topic of "Electronic Mapping to Support Intersection Collision Avoidance Services." It was agreed to continue to focus on advancements in digital maps in 2004 and to hold the next meeting in conjunction with the ITS World Congress to be held in Nagoya, Japan in October, 2004. The FHWA sponsored a research fellow from Japan. The process involved the nomination of a Fellow by the MOLIT of Japan, the acceptance of the nomination by the FHWA Associate Administrator for RD&T, and a contract between the Fellow and FHWA. The fellowship is awarded annually. A member of the FHWA Office of Operations R&D participated in the 6th International UTMS and NPA conference in Tokyo in March. In December, 2003, the Office of Operations R&D hosted Yasushi Okamoto from the Japanese National Police Agency for a 2-month assignment supporting the ITS Advanced Transportation Management Systems (ATMS) program. Mr. Okamoto had spent the previous 2 months with NHTSA. UTMS and ITS America have signed an agreement to continue cooperation and information exchange between the United States and Japan and anticipate that representatives of the Japanese NPA will continue to be assigned on a rotational basis to support the ITS program in the future. International technology scans are an important means for identifying, assessing, and importing foreign highway technologies and practices that can be cost-effectively adapted to U.S. Federal, State, and local highway programs. Similar to the "benchmarking" process that is widely used by firms in the private sector, scans are conducted as a means of comparing products and best practices with the intent of identifying better, safer, and more environmentally sound technologies. Scans help to limit duplication and promote information sharing, thus allowing technologies to be put into practice more quickly and efficiently. Scanning reviews add depth and cohesion to research and practice in the United States. The process and findings generally complement and enhance the existing knowledge base in the U.S. highway community, often putting innovations on the fast track to deployment. Scan teams represent FHWA, State highway departments, local governments, and where appropriate, transportation trade and research groups, the private sector, and academia. Personal domestic and international networking, team dynamics, and the creation of U.S. champions for promising foreign innovations are keystones of the methods used. The program's goal is to successfully implement the world's best practices in the U.S.
Driving simulators and infrastructure design guidelines. Several years ago the European Union reviewed the FHWA research program to identify projects that complemented their own plans. As a result of this review, two areas for cooperation were identified: One was the development of road profilers, and the second involved a research project titled "Repair Versus Rehabilitation of Concrete Pavements." In support of the Fully Optimized Road Maintenance (FORMAT) project, a study was conducted on the application of a bonded concrete overlay to a continuously reinforced concrete pavement in Texas. The principal investigator also analyzed accelerated load tests, of asphalt concrete pavement maintenance techniques, in several European nations. The guidelines produced by the review led to the development of a software tool for the analysis of rehabilitation strategies called Strategic Analysis of Pavement Evaluations for Rehabilitation (SAPER). SAPER utilizes condition surveys, laboratory and field tests, traffic forecasts, and climate to arrive at the optimum pavement treatment option. Launched in 1999, the CPTP is a 5-year, $25 million effort charged by TEA-21 with carrying out "research on improved methods of using concrete pavement in the construction, reconstruction, and repair of Federal-aid highways." FHWA and the Innovative Pavement Research Foundation (IPRF), a concrete paving industry consortium, jointly administered the program. The program's partners also include State highway agencies and TRB. Specifically, the partnership will ensure that the highest priority concrete pavement technology needs are addressed; the expertise and resources of States, industry, and FHWA are used effectively and efficiently; and new concrete pavement technology will proceed rapidly from research to implementation. In addition to the oversight provided by FHWA and the IPRF, the program receives guidance from the TRB Committee for Research on Improved Concrete Pavements. The committee reviews and provides advice on the program's long-range work plan and project tasks, including objectives, appropriateness, and the likelihood of success. The committee has representatives from industry, academia, and State highway agencies, FHWA, IPRF, and AASHTO.